Farm Girl Pink....: ~ New brownie pan in the kitchen! I have shown off one of my favorite Pyrex baking pans in my kitchen. It is this wonderful yellow square brownie size pan. I use this pan all the time. I have three of the four pieces of this weirdo yellow-green Pyrex set. They are impossible for me to photograph and have the color look correct. I am missing the pie plate. Sadly, because I am the one who broke it. It got away from me one night while I was hand washing it. And broke it, as it bounced off the side of the sink. Now this image shows the odd coloring of this yellow-green color. It is posing with one of the smaller pale yellow casserole Pyrex bowls. Anywho... I was headed somewhere... I added a new brownie pan to my collection. Which I do have the larger casserole that matches it, in my kitchen cabinet too. 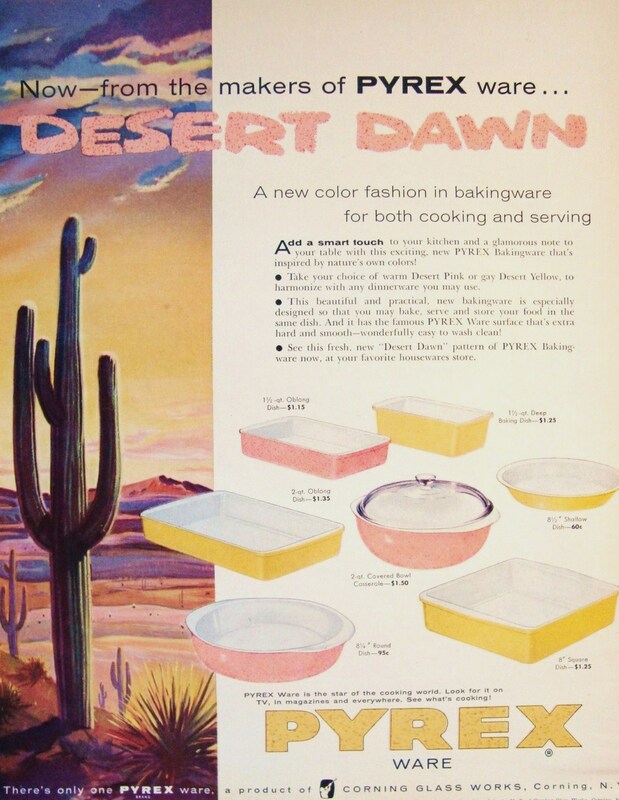 Which may be part of that Pyrex Desert Dawn set... I could not find my copy of this advertisement which is not faded all to bits. But Pyrex did issue two very distinct pink colors. And these two... brownie pan and large casserole... are much deeper pink than most of vintage Pyrex. Yet they are all still amazing, to look at! Love the pink and yellow brownie pans - I have bright orange and denim blue ones -they rock! I am a huge fan of these square brownie pan. Once I learn to spray it down with Baker's Joy, before pouring the batter in it. I am even using them to make my cornbread in too. As much as I love my cast iron skillet for baking cornbread. The Pyrex make a nice crust on it too. And is much easier to handle getting out of the oven. And not end up burning myself.